This is Baron. He is 3 months old in this pic. Baron is an active fellow, he keeps my wife and I very busy. I hope he grows into them ears and paws! Total German Shepherd: I imagine he'll be a big fellow when he does - he's so handsome. They seem to grow too. 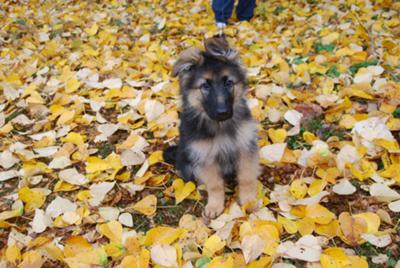 Hi, I love the pic of your long coat GSD. I have a long coat too, Ruger. I was told he looked like the Easter bunny, so the ears seem to grow with the pup, so do the huge paws and those redwood sized legs. But I think the long coats are heavier boned and bigger for some reason. But any way, your pup is gorgeous and I am sure you will have many years of fun, just get a ball and play play play!! !